Adventures of an Introverted Traveler: "Do you know what is syphilis?" 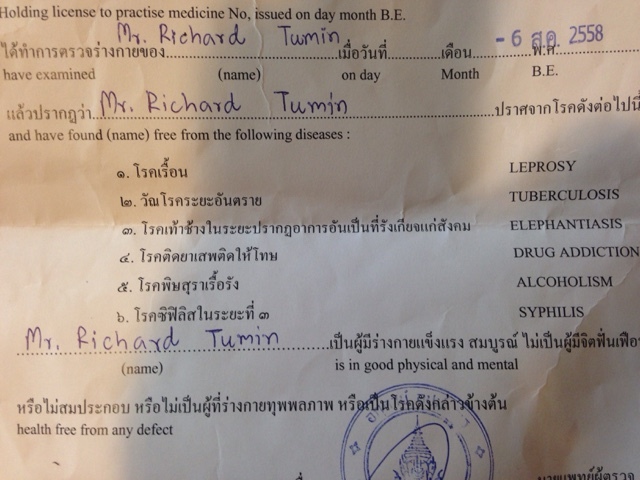 This was not a good start to my blood-work analysis by the Mahidol Clinic doctor. I guess I better take a step back in this story. In order to get a work permit in Thailand, you must pass a medical exam. This of course involves some blood testing for the usual suspects - HIV and syphilis being two of the contenders. I had gone earlier in the morning to get my blood taken so that I could meet up with the doctor when he came in that afternoon. It all started with "do you speak Thai?" Of course, I answered "no" as I now know about as many words as I have fingers on one hand. The next question presented to me by the doctor when we was looking over the blood-work results was "do you know what is syphilis?" I responded with a quick yes, as those horrifying pictures from health class do long ago started to flood my mind. He then proceeds to write syphilis out on a piece of paper. Spelling it out letter by letter. All I can think of is "why the hell is he saying I have syphilis?" I then point to it and say "no?" To which he looks at me very funny, and does not say anything. I point to it again and do a few hand gestures for no, including but not limited to frantic waving followed with some hard slashes through the air. This was of course coupled with a horrified and possibly syphilitic look on my face. He then points at syphilis written on the paper, and gestures a "no" and says "you normal." I say back to him, "I normal, no syphilis?" He then responds again, "you normal, good"
This doctor, who could have been no older than his early twenties almost gave me a damn heart attack. Thanks for the laugh. Oh such fun when you are living this adventure.